The GGHH Guidance Documents for sustainability action provide a comprehensive and global view into the GGHH sustainability goals. Written and reviewed by leading experts from around the world, each guidance document introduces a specific GGHH sustainability goal and covers the various opportunities within the topic area for GGHH members to act to reduce their environmental footprint. The Guidance Documents are available for members on GGHH Connect. To access them, click here. 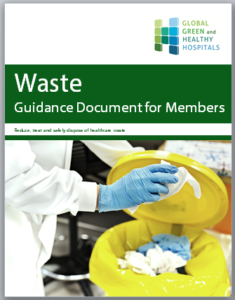 The Waste Guidance Document sets out strategies for health care facilities to meet the target of treating their waste in the most sustainable way possible from transportation to storage, treatment, recycling, and disposal. Recommended actions in this guide are supported with reference to real world examples and other resource on successful implementation. To access the full version of the Waste Guidance Document, click here. The Energy Guidance Document provides a comprehensive look into energy use in health sector and identifies opportunities for health care leaders to improve the efficiency of their facilities and increase their use and generation of energy from renewable sources. 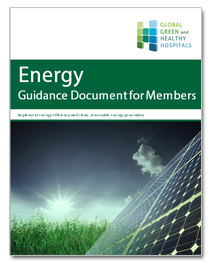 To access the full version of the Energy Guidance Document, click here. The Water Guidance Document helps health care leaders make the changes needed to ensure provision of potable water, reduce their water consumption, responsibly treat wastewater and minimize the environmental impacts of storm water runoff by identifying specific actions that health care facilities can take. 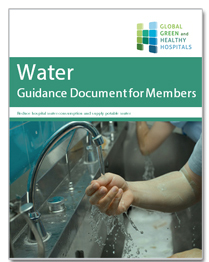 To access the full version of the Water Guidance Document, click here. 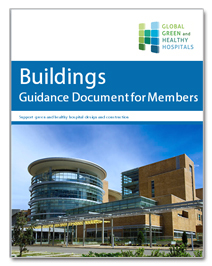 The Buildings Guidance Document helps health care leaders make the changes needed to reduce their resource consumption, use environmentally sustainable and healthy building products and minimize the environmental impacts of new and existing health care buildings their facilities by identifying specific action and opportunities they can take. To access the full version of the Buildings Guidance Document, click here.